When a CD or a DVD is inserted into an autorun-enabled CD-ROM, the Windows autorun or autoplay feature automatically launches the program contained on the disk. Windows autoplay usually gives you the option to choose what you want to do with the inserted media, but that selection is active for the current medium only and often does not seem to be completely working anyway. If you insert an audio CD into your drive, a player pops up and starts playing the CD immediately. This may be a benefit for some, but many users find this annoying. If for example you are fast enough and open your CD in Explorer before the autorun kicks in, the autoplay opens its own instance of the CD instead of synchronizing it with your Explorer window. This can be very frustrating especially on slower computers. There is an easy way to disable this. How to disable autoplay just one time? In case you do not wish to disable autorun/autoplay permanently, you have the option of skipping the activity ad-hoc, on case by case basis. When inserting a CD into your computer, hold down the SHIFT key. This will disable the autoplay feature for the CD you are inserting. The autorun will be bypassed just this one time. The next time you play a CD, autorun will be active again. How do I disable autoplay / autorun permanently? A solution to this differs based on the version of Windows that you have on your computer. Go to your My Computer and explore your drives. Then right-click on the drive icon for your CD drive. This can be either a CD drive or a DVD drive. Select Properties. Go to the AutoPlay tab and choose the desired action for each type of CD. For example, if you open music CDs, choose Music CD and then pick the action to perform. You would want to select Take no action in the menu as shown in the picture below. Note, you have to do this for each CD type. The problem with this setting is that it some times does not get set no matter how hard you try. If that is the case with your computer, you might want to try the registry modification way. How to disable autoplay autorun in registry? In this case you would open the Registry Editor. You can do this by going to the Start menu. Click the Run button and type REGEDIT.EXE. If you look at this registry key for the autorun feature, you can see the Autorun value there. Edit the Autorun value and type 0 for it. If the Autorun value is not there, create it by selecting Edit -> New -> DWORD Value. Then type Autorun for its name. You might have to log out and then log back in for this change to take effect. 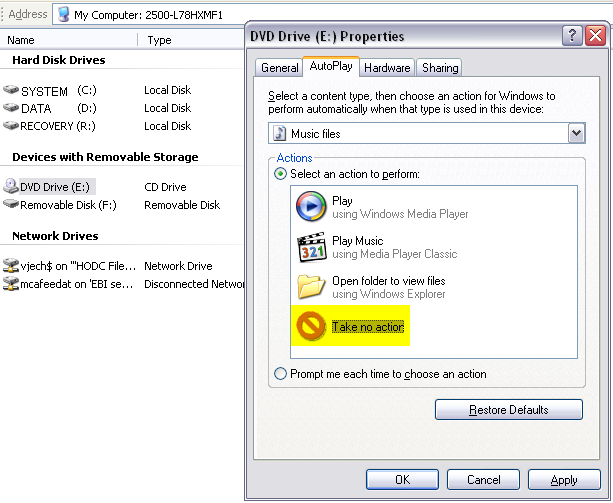 Note, taking advantage of this solution, Windows should disable the autorun and autoplay notification for any type of CD or DVD regardless of whether your CD is burned as music, movie, data, or picture. I heard autoplay can be disabled in group policy?